Under the hot sun at the Action Africa Help International (AAH-I) workshop in Adjumani, Uganda, 30-year-old Akur Garang Ajak is engrossed in resolving a plumbing issue for a client. Watching Akur, it is difficult to imagine that not so long ago she was running for her life, not knowing what the future held. Akur is originally from South Sudan. “The instability in my country has left many of us in despair. Because of the war our families are scattered across the region. I was born in Ethiopia and raised in Kenya. My parents fled South Sudan in 1992. I moved back to my country in 2008 with my parents, husband and two children. We were finally home. But soon after the peace and safety quickly shifted to fear as war broke out in December 2013”. Akur fled to Juba through Jale and Mangalla before being received in June 2014 at the Zaipi Reception Centre in Adjumani-District in Uganda alongside other refugees. She was transferred to the refugee settlements of Alere and Olua before settling in Mirieyi Refugee settlement in December 2015, where she currently lives with her 4 children. The conflict in South Sudan has driven millions of its civilians away from their homes. According to data from UNHCR, more than 2 million have escaped in a desperate pursuit of safety. Akur is one of them. 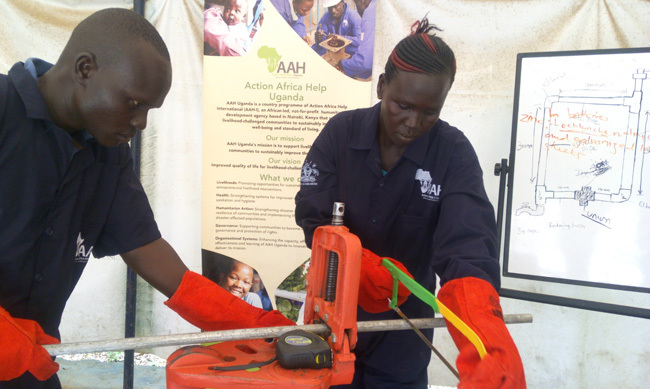 The Uganda country programme of AAH-I, AAH Uganda, is providing vocational skills trainings to both national and refugee communities in Arua and Adjumani districts. This initiative is implemented with funding support from Enabel (Belgian Development Agency) under AAH Uganda’s vocational skills training project. Akur is enrolled in the plumbing class. “The aim of the project is to enable trainees to acquire demand-driven skills for which they will receive certification. Akur is one of our 270 determined and promising learners. Other students are being trained on welding, motor vehicle and motorcycle repair, electrical installation and hairdressing,” says AAH Uganda Project Field Officer Mpaso Kampanya.